I assume everyone is following the weekend, and today's, news. This is purported to be a pdf of the 302 examination of an FBI worker, just handed over by the FBI today. We need a major increase in demand in the rope and lampost industries. Perhaps in tar and feathers also. We used to point fingers and laugh at Mexico being run by a handful of families for their own benefit not that of the citizens of Mexico; we are no different. Did you ever think we'd be living in the Twilight Zone, my friend? These crooks have skirted the FOI requests by obfuscation and insider corruption. Is there any doubt if this were a Repub candidate it would be the lead, middle, and last story of every broadcast for the next month, as it should be? If this country ever needed God, it's now. TK, I fully agree with that statement, and I hate to be a Jeremiah; but is He really going to come to our aid when we are knee deep in depravity and murder 1 out of 4 of our babies in the womb?Even the ancient Israelis didn't have that bad a record and He allowed them to be destroyed. I hate to say it, I really do, but I foresee a severe chastisement descending upon us because we have become so wicked and, worse, revel in our wickedness. Maybe Trump can change things enough we will begin to turn things around but the task is Herculean, and as Scripture tells us, "With God all things are possible". Ok, end of sermon. Back to the secular side of things. If Hillary gets elected it will be God's judgment against us. I cannot see any other way to interpret it. If the people knowingly elect such a corrupt leader it would be evidence of our moral failure as a Nation. The whole world will suffer. The question is will the people know how corrupt Hillary. Another article about the state department's Kennedy trying to coerce the FBI into changing the classification of leaked eMails. This is amazing and shows the collusion between Hillary Clinton and the State Department to aid Hillary through coercion. This should spread like wildfire in exposing the corruption. 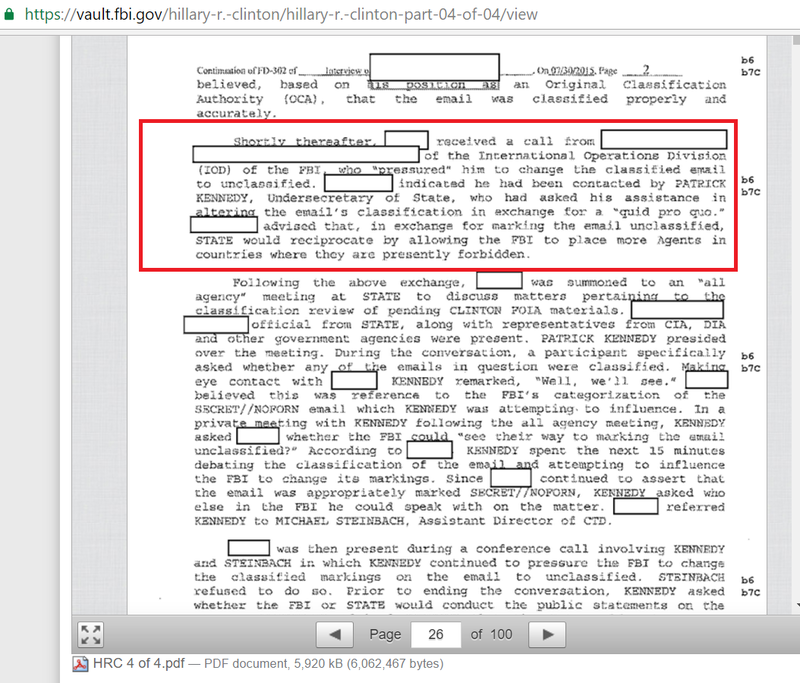 These new documents released by the FBI just this morning show that Patrick Kennedy, a senior State Department official, tried to convince the FBI to mark specific emails unclassified in exchange for a quid pro quo. Whether wittingly, unwittingly, or through outright fraud, if Hillary is elected the result for us and teh world will be the same. If anyone is curious I tracked this to the FBI web side vault. Each link to the FBI web site gives you the option of viewing the document page by page or downloading the entire document.